One of the best things for me about knitting in 2009, as opposed to 1989, is that there is so much more yarn to choose from and I finally have some money to spend on it, and you can order it online and have it mailed to you, so you get surprises on blustery gray days. Surprises like yarn that looks like a blustery gray day, except soft and warm. 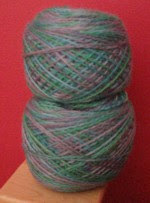 And you might notice something else about this yarn... like, it's not in a skein. I do enjoy winding my own yarn from the back of a chair. Um, really. But sometimes instant gratification is called for and for a ridiculously small fee Dani was willing to make these little cakes for me, bless her. So. I have new yarn! and it's sock yarn and what I really need is a hat so you know where this is going. Much, much less writing and much, much more swatching. Oh! OH! I can't wait to see it!!! !